I am always on the lookout for new and exciting products to try for Ems. (I think all moms probably are!) So whenever I am shopping and out and about I always wander down every baby/toddler aisle looking for new toys, accessories and feeding items. In this last month Ems has become very independent with her eating, choosing to self feed with a fork or spoon almost every meal. Anything that can make meals less messy and easier for her to self feed are great by me! When we go out to restaurants I always bring a bib, a plate, a cup and a utensil just because the familiarly of her own items allows her to be the most successful. It also allows me to then have a stress free meal because I am not worried about restaurant plates being broken or glass being shattered. This Nuby Sure Grip Miracle Mat Section Bear Plate has been a life changer! When we used to go out in public, I would bring a flat silicone mat with me to restaurants but they didn’t stick to the tables well and Ems would become preoccupied with lifting them up and therefore knocking her food on the ground so I quickly gave up on them. This mat however, suctions incredibly easy to the table with only a small amount of pressure. That way it doesn’t move on her as she is attempting to pick up her food as well as her little hands aren’t able to lift it up and make a mess. It’s super easy to clean and is even dishwasher safe! It’s perfect for restaurant eating but also great for home use because it makes meal time cleaner and way more efficient! 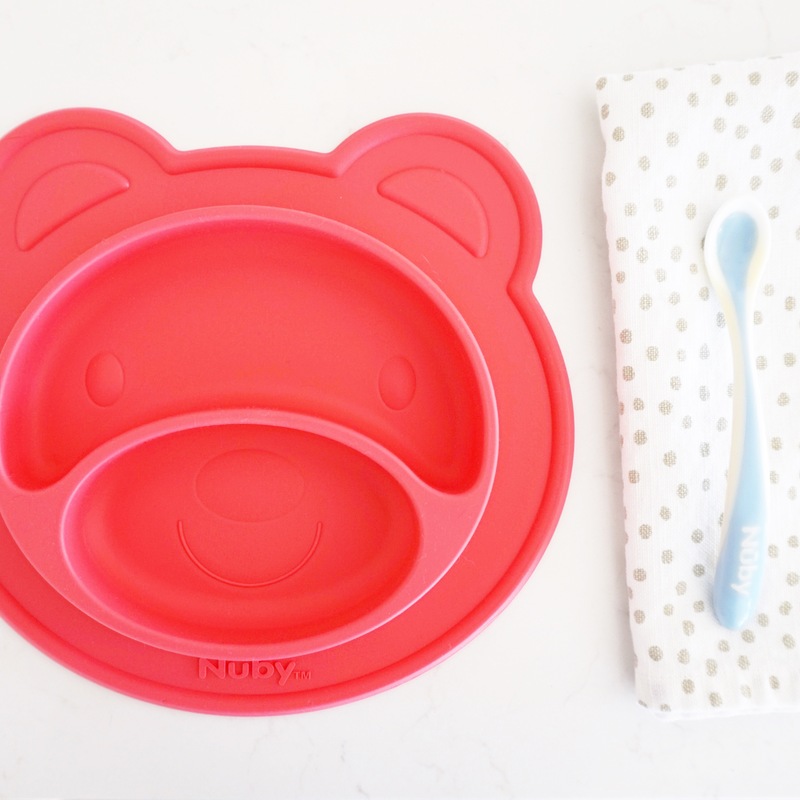 You can purchase the Nuby Sure Grip Miracle Mat Section Bear plate for yourself from Canada’s Baby Store here. 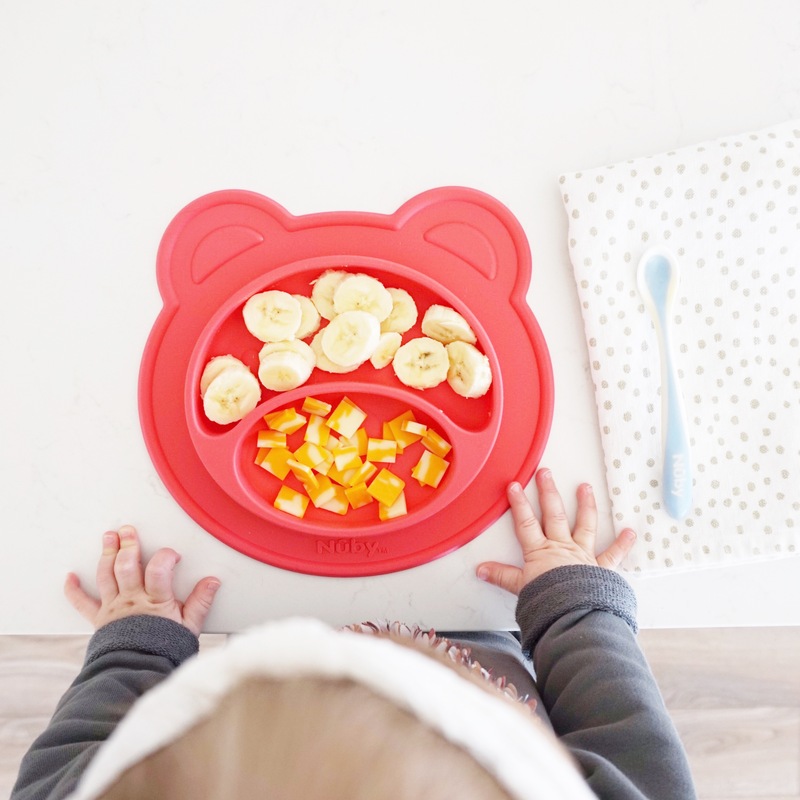 Today I’ve partnered up with Nuby Canada to giveaway one Sure Grip Miracle Mat Section Bear Plate to one lucky winner! All you have to do to enter is head on over to my Instagram account and find the picture above to get all the details. For a bonus entry, leave a comment below on this post saying what Nuby product you love the most! You can also check out Nuby’s other great products on their Instagram page and their Facebook page. Giveaway for the Sure Grip Miracle Mat Section Bear Plate ends Sunday February 26 at 11:59pm EST. Winner will be announced on my Instagram account on February 27 and will have 48 hours to respond. This sounds amazing. I have been looking for a good plate and utensils for my 10 month old boy who LOVES to eat but can be destructive and messy 🙈 Would love a chance to win and try this out at home and in public! We need this! Sounds amazing and it’s oh so cute! My little girl loves to eat and loves to make a mess (lol) so this plate would be great! I love how cute the mat is, and glad to hear it has good suction. On Instagram, I am @minty_mo99. Thanks! Certainly makes meal times fun…and less messy! Love this adorable plate! Would love it for my lil guy who loves bears and eating! !